It all started with a dead body on an outcropping. That one event threw Jake and Kayden together, working to figure out who was out to see Conrad Humphries’ demise. 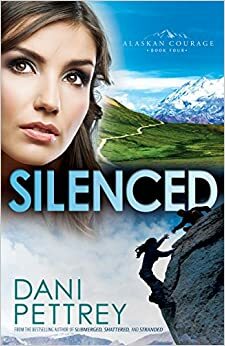 Silenced (Alaskan Courage Book #4) by Dani Pettrey is a romantic suspense novel that follows the investigation of Jake and Kayden to find Conrad’s killer. Only, that investigation is going to get them both way more than they bargained for. Everything seems to wrap up smoothly and quickly, but not for long. Threatening messages and vandalism indicate that someone is not yet finished. How will this adventure change Jake and Kayden’s relationship? Will they survive to find out? The thing about suspense novels is they warrant a short synopsis, because seriously, who wants to know much of the plot in a suspense novel, right? So, that’s all you get, and I’m moving on to the review . . . I would like to put this gently, because I know that writing a book is not a minor undertaking, but I did not like this book at all. I finished it so I could write this review. Now, I’m not saying that it’s an awful book, and I’m sure that there are some of you who will like it, but I was not a fan. Here’s why: to begin with, I received a free review copy of this book, and I didn’t realize until I opened the mail that it was the fourth book in a series. So, obviously a lot has already happened in this family that I do not know about, so perhaps I would have felt more connected to the characters had I read the previous books. But, I also was just not a big fan of the writing style. This was clearly listed as a romantic suspense novel, but the romance side of the story was very frustrating to me. I felt that the relationships were very cliché, and the details of the characters’ feelings were reiterated far too many times. I prefer when an author lets the characters demonstrate their feelings rather than tell me straight out, and especially not tell me straight out every few pages. Yet, I felt like that was happening, and it really distracted from the suspense of the story. Now, I will say that there was nothing objectionable in this book. It is a Christian fiction novel, and there are some good nuggets of encouragement in there, but even those were not woven into the story, but plopped in here and there. So overall, this is not a book that I am going to be talking about and recommending, but the issues I had are stylistic. So, I will leave it to your own discretion as to whether or not you’d like to read it! Have you read this book? What were your thoughts? Leave them in the comments below! I received this book for review purposes. All thoughts and opinions are my own.